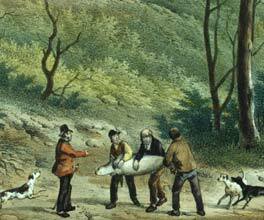 The British government's second attempt to establish a convict settlement in Port Phillip Bay took place in 1826. Just like the attempted settlement at Sullivan Bay in 1802, this second venture was inspired by glowing accounts from explorers. In 1824, Hamilton Hume and William Hovell had explored what they called ‘Western Port', and their positive reports – coupled with ongoing concern about French interest in Australia – made a strong case for further exploration of the area. The French were indeed in Western Port, and in 1826 French artist Louis de Sainson was on the exploration vessel l'Astrolabe when he recorded an image of what appears to be fishermen hauling a net in Mangrove Creek. In Sydney, Governor Darling organised the expeditionary party and sent ships with 20 soldiers, 20 convicts and a few women, as well as William Hovell. The vessels arrived at Western Port in December 1826, near what is now Corinella. After a camp had been established on shore, exploration commenced of the surrounding area. Hovell soon realised – to his embarrassment – that what he knew as ‘Western Port' was not the site where the expedition had set up camp. He and Hume had confused Port Philip and Western Port, and the expedition was over 100km away from where they were meant to be. I have not found any disposition on the part of the Inhabitants to Settle in that part of the Country, which should Your Lordship consider that the object of taking formal possession of it has been answered, might be sufficient reason for withdrawing the Persons sent to establish the Settlement. A significant motivator for settling in Port Phillip was the fact that the French had already visited the area, and the colonial government feared the French would claim the area first. This was the last attempt to establish a convict settlement in what was to become Victoria, although in 1840 explorer James Riley noted that convicts who escaped from Van Diemen's Land were occupying the buildings of the Corinella settlement of 1826, although they were abandoned a year or two later. One man's private thoughts and observations provide a window into life in 19th century Gippsland.